BEST oil sumps PART DEALS MINIMUM EFFORT! The oil sumps, or oil pans, in vehicles are important because it contains the oil that is pumped around the engine and stores it until required which means that should there be a leak or the sump plug fails, then there will be a loss of oil and potential engine failure. Here we explain more. Should the oil sump in your vehicle, sometimes it's known as the oil pan, become damaged then you'll need to act quickly to replace it because it stores the oil that is pumped around the engine block to keep all of the metal working parts lubricated and working efficiently. There's a sump plug in the base of the oil sump and this can be unscrewed so the oil can be drained if necessary. Also, you may need to appreciate the difference between dry sump and wet sump systems. When it comes to replacing oil sumps then most modern cars have a wet sump system which basically means that the oil from the engine is collected in the sump pan before it is then recirculated back into the engine and around once more. This system can be boosted with improved parts that will help increase oil control and improve engine power. In comparison, for those cars with a dry sump system these tend to be for professional racing cars because they need more control over the engine oil and performance and with a dry sump the oil is pumped out of the pan and stored separately before being recirculated around the engine block by an external pump. This means that the oil sump itself will be left 'dry' and it's a popular choice for those who are modifying their cars and looking for improved motorsport performance because there's less weight for the rotating assembly, so it can spin in more space and have increased oil pressure, along with a higher oil capacity for the necessary performance. 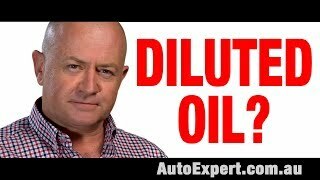 It may be a good idea to take your vehicle to a professional if you believe there's an issue with the oil sump and have them carry out a thorough diagnosis and then they can carry out a repair using quality items from a reputable supplier. It may be a problem with the oil sump plug and these can also be sourced separately from the oil pan. 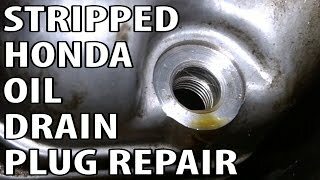 It also needs to be appreciated that because the oil sump is located beneath the engine it can be damaged by speed bumps and other road debris and should this occur, then you'll need to replace it quickly because you will be losing oil which could, ultimately, lead to oil being drained from the engine block and the engine seizing up or failing. If you are searching for oil sumps or oil pans, then it's important that you buy a quality item that meets your vehicle manufacturer's recommendations and get this from a reputable supplier and the MorePartz site can help. One of the most convenient ways to obtain replacement oil sumps parts for your is to use your local or highstreet car part supplier. The advantage of using a shop is you get face to face support in purchasing the oil sumps part you need. One of the most beneficial aspect of purchasing from a local store is often highstreet shops will take your oil sumps part back if for some reason it doesnt fit, and if in stock instantly replacing with the correct part this can often be easier and quicker than repacking and posting, and then needing to wait for the replacement oil sumps part to be sent out. Salvage and breakers yards are are an excellent source of replacement parts, not only for oil sumps spares but for a whole number of different parts. Breakers yards and salvage yards purchase damaged cars and then they dismantle them and sell the parts on to the general public. 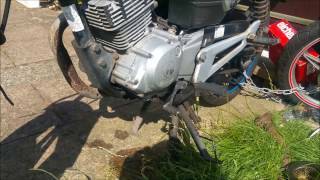 If you want to make even more savings then purchasing your required part from a local could be the answer, shops, private sellers stores and all sorts of users post oil sumps parts for sale using classified websites such as preloved, gumtree or even craigslist. You will have to be a bit more savvy to purchase via this channel, there are no assurances that the part you purchase is fit for purpose and often if you purchase oil sumps parts from the public you are not protected - mostly oil sumps spares and parts are sold as seen, so you really need to test your oil sumps or know about the part your purchasing in some detail. For the convenience of shopping for spares and accessories without leaving your home then the online store usually has everything you need to get your part oil sumps part replaced. Its easy to find a large number of online stores to purchase your oil sumps replacement parts and accessories, usually the offer fast delivery to your home and refunds or replacements if the oil sumps part turns out to not be suitable as long as you have the original packaging. Some even offer next day delivery offering one of the most convenient ways to purchase oil sumps car parts. Some websites offer the ability to enter your car details and the oil sumps part required so they can source what you need by contacting a large network of suppliers to give you quotes on the oil sumps part your looking for. 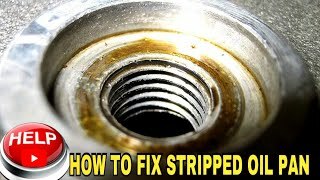 DIY | STRIPPED ENGINE OIL PAN BEST FIX! 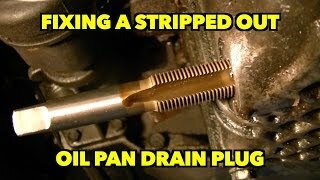 Fixing A Aluminum Stripped Oil Pan Drain Plug.